Paris Berelc & Jack Griffo Kiss Inside Nylon’s 2018 Young Hollywood Party | Amanda Steele, Jack Griffo, Kian Lawley, Lana Condor, Larsen Thompson, Mirai Nagasu, Paris Berelc, Ronni Hawk, Samantha Logan, Witney Carson | Just Jared Jr.
Jack Griffo steals a kiss from girlfriend Paris Berelc inside NYLON’s 2018 Young Hollywood Party held at Avenue Los Angeles on Tuesday night (May 22) in Hollywood. 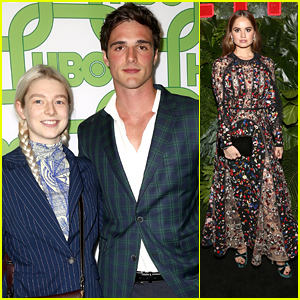 The real-life, and on-screen couple, stepped out for the party after filming for Netflix’s Alexa & Katie earlier in the day. On My Block‘s Ronni Hawk, and 13 Reasons Why‘s Samantha Logan were also seen at the bash, alongside Larsen Thompson, Amanda Steele, Mirai Nagasu, Witney Carson, Lana Condor, and Zac & Mia‘s Kian Lawley. FYI: Paris wore an Alberto Audenino look with Casadei shoes and Swarovski jewelry. Larsen stepped out in Nicholas Kirkwood shoes. Amanda is wearing Brian Atwood shoes.